Our products are designed to increase energy efficiency which will save You money! Beautiful Real Wood Interior, Fiberglass Frame and Exterior for Strength and Durability. Your Chicago Replacement Window Source! When deciding whether to purchase replacement windows in Chicago you must take into account the following factors: function, security, energy and money savings, design and budget. Replacing the windows in your home will raise it's value, will lower your monthly energy bills, make your home more comfortable, and make it look cleaner and more modern. But remember, choosing the right contractor is just as important as picking the right product. The best products installed poorly are just as bad as installing cheap products well. With Innovative You Get Great Products Installed by Highly Skilled Professionals. Isn't It Time to Get Started? Get a Free Quote Now. For the budget conscience homeowner or rental property owner,Vinyl maybe right for you. The latest technology in home windows. The composite window is 400% stronger and 200% more energy efficient. For the homeowner who wants a rich, warm, traditional look Wood windows are perfect. 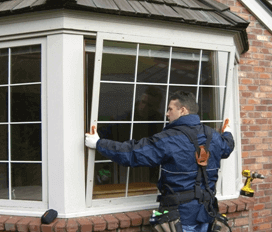 Eco-maxx Vinyl replacement windows combine energy efficiency, functionality, and curb appeal at an affordable price. This product is an economical alternative to higher priced wood products and will keep your home comfortable for years to come. You will be amazed by the Strength, Energy Efficiency, and Style of Our flagship product. We call this window the "Vinyl Killer" because it blows away all of the inferior plastic windows that are being sold today. Elegance and Style, Andersen has encompassed the beauty and tradition of wood windows for over 100 years. From the affordable 100 series to the ultra rich A-series and E-series, Andersen has a wood product for any budget or taste preference. A product that has taken the Chicago market by storm. A product that is wood where you want it and fiberglass where you need it. Simple and Attractive, the Marvin product line combines a great looking wood interior with the strength and durability of a fiberglass frame and exterior. The most recognized name in wood windows. Pella offers products that combine attractive styling with innovative features. Not the least expensive option but for the homeowner who wants the most known brand that has lasted the test of time, then Pella is for them. YOU NEED NEW WINDOWS NOW! #1 Your Old Windows are Costing You Money! Whether your home is 150 years old or 5 years old, if you have old wood casements, double hungs, or sliders or construction grade vinyl, you are literally throwing money out the window each and every money! Products that are engineered and produced now are many times more energy efficient then products made just five years ago. Glass packages alone have drastically increased the energy savings homeowners are seeing. Thermal pane double and triple glass packs, warm edge spacer advances, and chamber injected with scientifically tested inert gas mixtures have made today's products light years more efficient. #2 You Are Killing Your Furnace and Air Conditioner! When you have opens in your walls that leak air and are not insulate dwell you are running your heating and cooling more often then they need to be to regulate the temperature in your home. You are not just paying more to run these systems, you are putting them the rigors of running them more often than they need to be. Excessive use means short life cycles and higher cost for repairs and maintenance. Sure Jim next door loves your barbecues but your old dirty exterior that is falling apart is making him upset. A poorly kept up home lowers the property values in the whole neighborhood. Not to mention is embarrassing. Imagine how proud you will be of your home when you finally take the plunge and do what you know you need to do, replace those old eye sores. If you have ever bought a house you know that one of the most important things a home can have is a view. But how good is the view through fogged glass, pealing paint, and cracked frames. Nothing looks so good as a new, fresh, clear glass opening to enjoy the view from your living room, bedroom, or dining room. Imagine a new bay or bow style window with a comfortable seat to read or meditate in. Do you dread trying to let fresh air into your house because things that are supposed to work don't? Sashes that are hard to open are a real pain in the rear. They stick, they are difficult to operate, and they are actually dangerous. Imagine there is a fire and there is no egress to escape out of? Are all of your exits operational? Is your family safe? Painted shut and non-operational exits are a real danger. Click the Button to the Right to Get our price on vinyl, composite, or wood windows from Innovative Home Concepts.